Do geostationary satellites need to have the equator as the plane of rotation, and the earth's centre to be the centre of rotation? Can it rotate over, say, the Tropic of Cancer, focusing on a single city? If not, in which case, we need a chain of geostationary satellites to do a function, why employ geostat satellites at all? Aren't there satellites at lower altitudes which could do a better job? Earth's center of mass must be at one of the two focus points of a satellite's elliptical orbit, or at the center of a circular orbit such as a geostationary orbit. One cannot orbit a certain latitude, except for the equator. But there are clever alternatives for different purposes. Geosynchronous (as opposed to geostationary) orbits mean that the satellite will always be within sight from the same location on Earth, but it would move around and probably need antennas which continuously aim towards them. Japan is building its own regional GPS-system in this way. There are also semi-synchronous orbits which put the satellite at the same place on the sky at the same time every day. This is used for some Earth observation purposes because the shadows on the ground remain the same for the same location on Earth everytime an image is taken. Do geostationary satellites need to have the equator as the plane of rotation, and the earth's centre to be the centre of rotation? To be stationary above a point, yes. Can it rotate over, say, the Tropic of Cancer, focusing on a single city? If the satellite's orbit touched the Tropic of Cancer, it would not be geostationary since the orbit about the center of the Earth would move the satellite north and south to reach the Tropic of Capricorn as well. Any geostationary satellite can be placed so that a designated city is always in line of sight, it doesn't need to be directly overhead. If not, in which case, we need a chain of geostationary satellites to do a function, why employ geostat satellites at all? Only one geostationary satellite is needed for some functions, such as TV broadcasts to the Eastern Seaboard. Aren't there satellites at lower altitudes which could do a better job? It depends on what the job is. For continuous broadcast and reception of signals, a geostationary satellite is best. For obtaining crop information, a low Earth orbit satellite might be better. You cannot point an antenna with a fixed orientation at a satellite that is not in a geostationary orbit. So to get satellite tv you'd not only need a bunch of satellites in orbit instead of one, but every receiver would need probably at least a couple of dishes on complex and highly accurate alt-az mounts. (1) By the law of universal gravitation, All satellites MUST orbit around the centre of the earth. The plane of the Tropic of Cancer does not pass through the earth's centre and therefore cannot be the orbital plane for ANY satellite. (2) Since geostationary satellites must be located directly over the equator, their footprint does not extend to extreme North and South latitudes. To overcome this, an extremely eccentric orbital pattern called a Molniya orbit is used by countries like Russia (extreme North latitudes). The orbit is designed so that when the satellite is over Russian cities, the satellite is moving very slowly (in accordance with Kepler's second law) and remains "visible" to radio receivers for maximum time. Geostationary orbit simply implies a geosynchronous orbit where the orbital plane and the equatorial plane are the same. You could place a geosynchronous satellite over London, but it would not be visible to London all the time. 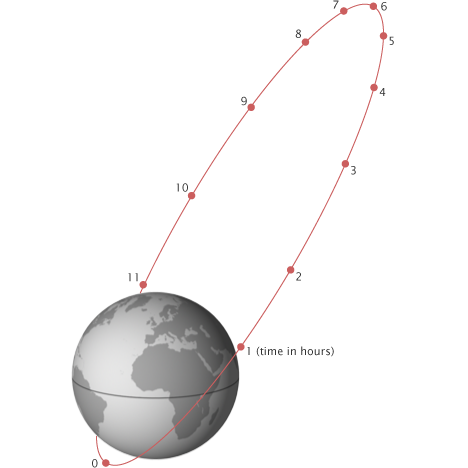 It's orbit would have a period of 24h, and if were exactly above London at 12 Noon, it will be exactly over London at 12 Noon tomorrow, but between these two times, it would not remain above London. Not the answer you're looking for? Browse other questions tagged orbit artificial-satellite satellite or ask your own question. Which approximations are required for the synodic period formula?